The editor and forger John Payne Collier (1789-1883) claimed to have discovered a Second Folio of Shakespeare which had been 'corrected' in a mid-seventeenth-century hand. He published this catalogue of the emendations, including his commentary on them, in 1852. Collier then presented the so-called 'Perkins Folio' to the Duke of Devonshire, whose successor allowed it to be loaned in 1859 to the British Museum, where a thorough examination exposed it as a forgery. 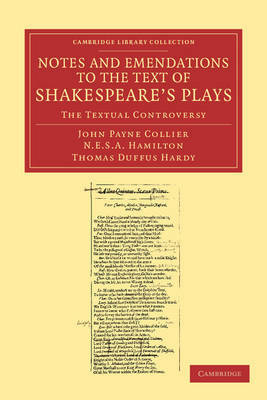 A storm of controversy followed and three of the key documents in the debate, all published in 1860, are also reissued here: 'An Inquiry into the Genuineness of the Manuscript Corrections in Mr. J. Payne Collier's Annotated Shakspere Folio, 1632' by Nicholas Hamilton (d.1915), assistant keeper of manuscripts at the British Museum; Collier's attempt to refute Hamilton's findings; and 'A Review of the Present State of the Shakespearian Controversy' by Thomas Duffus Hardy (1804-78).